[Updated April 2019] Summer is just over the horizon (finally), and that means you’re likely gearing up to spend as much time outside as possible. Your patio is already the go-to gathering place for enjoying the outdoors from the comfort of your own home. And with the right patio accessories, it can become the private yet inviting outdoor space you’ve always wanted. Creating the perfect patio doesn’t have to be expensive, or even time-consuming. With a few small touches, your patio can start looking like all those patios on Pinterest and design magazines you gaze at longingly. In this post, we’ll fill you in on the different ways you can improve your outdoor living space. What better way to enjoy your time spent outdoors than surrounding yourself with nature? But nature is sometimes difficult to get to and sometimes requires work. So why not bring nature to your patio? Landscaping pots and planters are a terrific way to accentuate your current patio accessories. Choose the colors which provide a contrast, or select hushed tones to really make the color of the plants pop. Additionally, including plants on your patio is a great way to improve your privacy. For greater privacy, try installing lattice structures for vines and climbing plants. No set of patio accessories is complete without a comfortable set of patio furniture. Depending on the layout and shape of your patio, you may want to opt for more smaller pieces, or maybe just a few larger items. For example, if your patio is longer than it is wide, consider a couch or bench which will take up the length of your outdoor space. Alternatively, if your patio isn’t accommodating to larger items, see how many ways you can arrange smaller pieces. Not all patio furniture is created equal, though. The best outdoor chairs should be weatherproof, stable, comfortable, and stylish. When the sun begins to set, try creating your own ambiance by installing new lighting. String lights, for example, are great patio accessories for a low price. For a modest price, your patio can glow in a warm and welcoming light. Lanterns are also a splendid way to add not only more light to your patio, but a custom-designed feel, as well. Try repurposing old metal hanging lanterns found in second-hand stores. These can easily be repainted any color to suit your decorative theme. While new lighting can help add some flair to your nights and evenings, patio accessories such as umbrellas and awnings will help you make the most of your summer days. First, consider the size and layout of your patio. From there, determine what areas need the most protection from the sun. If you have chairs and tables within a relatively confined area, you can get the job done with some well-placed umbrellas. However, if there’s more area to cover, or if your patio is tucked close to the side of your home, consider installing an awning. It’s a widely accepted fact that sitting around a fire on a cool summer night is, well, awesome. These aren’t patio accessories for everybody, though. Take care when choosing a fire pit and don’t risk starting your home or patio furniture on fire. There are a wide variety of sizes available, and may include a screened lid to prevent hot embers from flying around. If building fire isn’t your forte, though, consider installing a gas unit. Although a natural gas fireplace will be more expensive than your typical portable fire pit, their safety and ease of use make them attractive patio accessories. No outdoor gathering is complete without the complimentary beverages and brats (or whatever else is on the menu). As such, patio accessories such as an outdoor bar and kitchen area will ensure you make the most out of time outside (while making less of the time spent in your kitchen). These accessories don’t need to be anything fancy, either. If you’re looking to keep it simple, try adding a standing table adorned with champagne buckets to keep your beverages cool. The flat surface of the table can also double as a food preparation area. Just because the greenery of the outdoors is within your view doesn’t mean your patio can’t have a few splashes of color. Adding color to your outdoor patio doesn’t require much. It can come in the form a few well-placed throw pillows. Or perhaps a new chair and a cushion to replace the ones faded by the elements. With this option, the only limit is your imagination. Try different color combinations to see what works best with your current decorations. If you want to actually paint parts of your exterior, try some of the simple painting hacks to further spruce up your exterior. Or, on the other hand, try downplaying the colors with muted and neutral tones. If you chose to add more plants to your patio (see item #1), try contrasting or enhancing the natural hues of the foliage. A floor covering outdoors? It’s not as crazy as you might think. There are plenty of all-season rugs available which will withstand the elements and resist fading. Additionally, a brightly patterned rug will also help add the previously mentioned splashes of color. 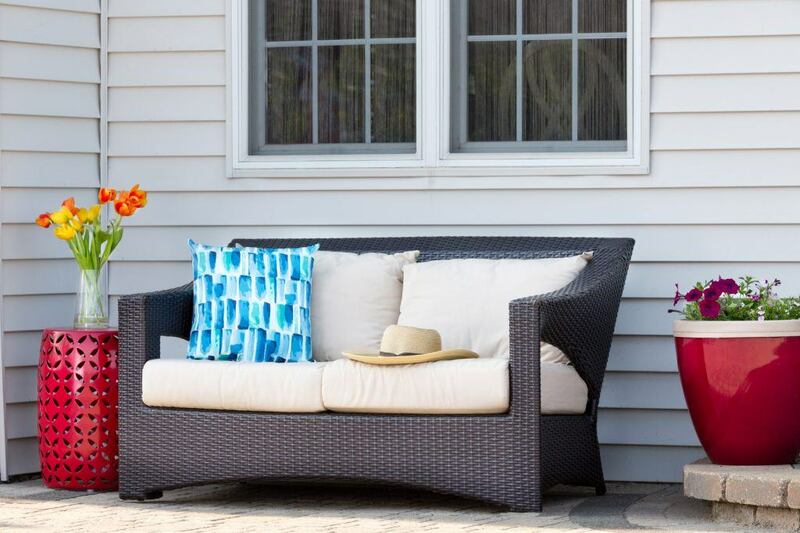 There’s no limit to the possibilities of piecing together the perfect patio accessories for your home. With a bit of patience and a plan, your outdoor patio will become the place everyone will want to gather around. Use these tips to get your start on planning and building the patio you’ve always wanted. 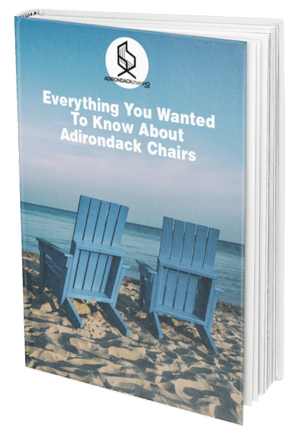 For more ideas on how to make the most of your time outdoors and how to maximize your comfort, check out this guide to choosing the best Adirondack Chairs!